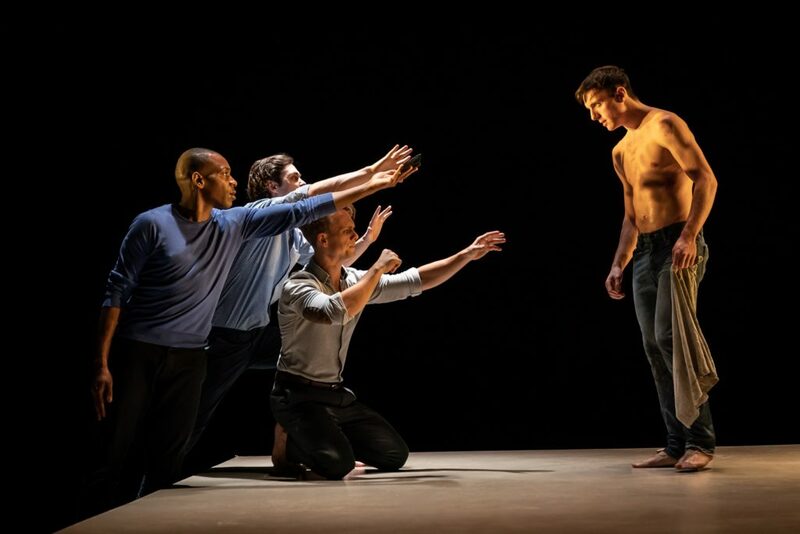 Epic in almost every sense of the word, ‘The Inheritance’, now enjoying a West End transfer after a sell-out run at the Young Vic, demands seven inspiring, moving, riveting hours to tell a story about how stories are shaped, and how they in turn shape those who listen to them. A group of men are trying to tell their life stories but need help. Enter E. M. Forster, whose ‘Howards End’ forms the basis of Matthew Lopez’s ‘The Inheritance’, to help the boys along. Expertly played by Paul Hilton, ‘Morgan’ – with the help of the cast – becomes our narrator, introducing us to Toby Darling (Andrew Burnap) and Eric Glass (Kyle Soller), whose rocky relationship the play centres around. Taking place almost entirely in Manhattan, New York, the couple face eviction, jealousies, successes and failures, all the while embracing and reflecting upon the lives of gay men over the last hundred years with each other and the group of friends that surrounds them. At its core, Lopez has woven an intoxicating tapestry of a show that demonstrates the problematic importance of legacy and community, especially for gay men today. We hear lots of stories. How these stories come together is the nature of ‘inheritance’. How do we learn how to be gay men? From each other? And what happens when that community of exchange breaks down? Drawing on the emotional devastation of the late-eighties/early-nineties AIDS crisis, Lopez suggests the trauma of one generation should be the next one’s inspiration. Bob Crowley’s sparse design is gorgeously simple, and along with Stephen Daldry’s astute direction, exposes the theatricality of the endeavour, whilst giving the cast plenty of space to play. The often cumbersome narrative elements to the play are expertly handled by the cast and director, who places his actors almost constantly on stage, listening, commenting and waiting for their turn. The need to flip on a dime from exposition to ‘scene’ is wittily and effectively handled by the cast at large. Burnap is mesmerising in his performance as Toby Darling, larger than life, hilarious, yet always hinting at a dark past, the reveal of which the audience really has a long wait for. Kyle Soller is equally courageous in his performance, able to be sentimental without parody and believably naïve all the way through to the end. Andrew Burnap and Syrus Lowe stand out in a tight, generous and incredible ensemble. ‘The Inheritance’ is essential viewing for everyone. Seeing a play on the West End that so unashamedly and honestly tackles gay male relationships (sexual and otherwise) feels in itself a remarkable achievement. I would argue Lopez could have trimmed down this story by a few hours and we wouldn’t have minded, but this emotionally stirring and inspirational production is well worth getting cramp for. When “The Lieutenant of Inishmore” premiered in 2001 it was considered quite dangerously close to the bone. The peace agreement was only three years old and Martin McDonagh’s dark play struck a chord. Michael Grandage’s revival, at a time when the Troubles seem assigned to history, has lost none of the urgency. If anything, its resonance is more acute than ever in today’s climate. At its centre, after one has waded through the blood and gore, is the story of Mad Padraic, a terrorist so brutal he’s been thrown out of the IRA. He’s certainly done the rounds – tortured drug dealers, bombed chip shops and drawn up his own list of ‘valid targets’ (a phrase often used by the IRA to justify its murders). Yet, he has a soft spot for his cat, ‘Wee Thomas’. The first time we meet Padraic he is pulling off the toenails of small time crook James (Brian Martin) whose crime is selling marijuana to schoolkids. Interrupted by a phone call from his dad to tell him his beloved cat is sick, he races home to Inishmore to comfort the creature. This is one of many hilarious scenes, played out with brittle but unbreakable comic timing by Aidan Turner. 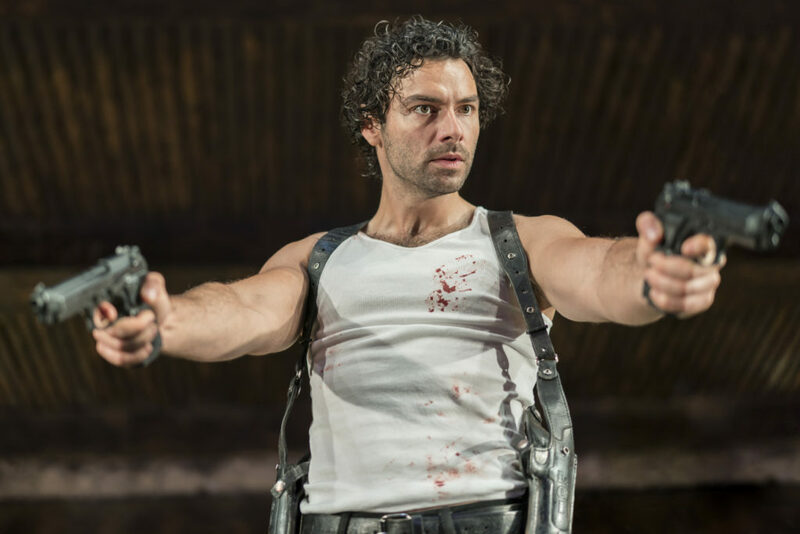 Wearing a blood spattered white vest throughout, his appetite for firing bullets matches the quick-fire delivery of McDonagh’s dialogue. At times verging on farce, the play is an obvious satirical attack on Irish terrorism that still has bite twenty years after the Good Friday agreement. McDonagh gets to the heart of the issue while being careful to criticise both sides: many of the jokes, at the expense of the IRA, refer to actual atrocities, yet he also refers to Bloody Sunday in which the British Army opened fire on a Civil Rights march, killing over a dozen unarmed civilians. But far from belittling historical fact, turning it into comedy is a far more effective way of urging an audience to question the issues raised. The comic and the horrific are perfectly balanced in Grandage’s production. It is Pythonesque to the extreme as the laughs pile up thicker than the blood and guts on stage. The blood is thicker than the plot, though. However, there is a comforting predictability to events which lets the audience relax and enjoy the performances. It is no spoiler to reveal that Padraic’s cat is not just sick, but stone-cold dead. Fearful of the reaction this would spark, the comic duo of Donny and Davey (Denis Conway and Chris Walley) try to replace it with another cat, smearing it with boot polish to disguise it as the real thing. This, more than any political ideal, is what precipitates the chaos and Padraic’s trigger-happy finger. Far from being a vehicle for Turner, this is an ensemble piece with equally strong performances from the supporting cast (not quite upstaged by the dead cats), especially Charlie Murphy as the love interest who lends a spirited, gamine lunacy to her character. Will Irvine, Julian Moore-Cook and Daryl McCormack, as the homicidal gunmen intent on annihilating Padraic, are wonderfully absurd, recalling the Marx Brothers trio while arguing over the accuracy of Karl Marx quotes. It is a violent play, but one that is clearly anti-violence. It definitely has a screw loose, but it is as tight as a hard-rock rhythm section; the banter ricocheting off the walls with the precision of a trained sniper. This is a high-spirited production which, taken in the spirit intended, is a sheer delight. Black comedy has never been so bright.